deliciously organized: giveaway! ~sarah pinto weekly planner! giveaway! ~sarah pinto weekly planner! As an avid organizer and planner, one of my favorite things to do during this time of the year is pick out a new weekly planner. And if you've read Deliciously Organized for a while now, you know I love Sarah Pinto's! Not only are her planners stylish, but they are functional! But truly the best part about her line is the fact that a portion of her proceeds goes to a very special cause near and dear to her heart. "this is my lucky year" design has always been one of my favorites! Sarah Pinto has a line of weekly planners, notebooks and postcards & today we are giving away one weekly planner! There are several others that I love that are on her website...go check them out and tell us which one you'd pick if you won! 1. Visit sarah pinto and leave a comment with which planner you'd choose, including your contact info. 2012 Stripe Planner for sure! I am a follower and love this blog! Defintiely the one with the dog! Reminds me of my sweet golden retriever. I'm also a follower! my favorite is also this is my lucky year!! You're killing me. I LOVE them! I am so super picky about my day planners too. I don't know how I would decide between the dog or the luck! I adore the stripe planner AND your blog. I'm a new subscriber and have been loving what I see so far! Thanks! What a great website! I love the lattice planner. Fingers crossed! I love them all!!!! But if I had to choose, the Lattice, Horseshoe and Polka Dot planners get my vote. It's good to know buying her incredible products supports her son, too! I like the striped planner. I love them all, but as an avid equestrian, I would definitely pick the "my lucky year" planner. i love this "this is my lucky year" one! thanks! So hard to choose! My favorite is the 2012 Lattice Planner! so adorable! I am loving the one with the blue and white stripes! And what a great cause sarah has. I would pick the blue and white planner! I love the "this is my lucky year"! I'm getting married in 2012 so this would be a lot of help!! I love them all but my favorite color is yellow and the yellow and white dotted one would be easy to find in my big bag! I'd choose the pink & red lattice and I'm a follower! I love the navy and white striped one. And what a great cause, thanks so much for sharing. I follow via GFC. It's so hard to choose - I like the striped one and the one with a horseshoe! Love her cause. A dear friend lost her son at 6 months so I am glad to see this. I love the Blue and white stripe. I LOVE the lucky year one! They're all beautiful planners! I love them all! I would be thrilled to win any of them. Love the horse shoe, stripe or polka dot! I would select the "2012 Lattice Planner" in pink and red. I follow "Deliciously Organized" via GFC! I would choose the Strip Planner. Great Cause! I follow and love this blog!!! My pick is the lucky year one. I think every year should be your lucky year but I also think it's nice to have such a happy message on the front of my planner too. A little smile each time I grab for it! I love the striped planner, but also the lucky year planner. Thanks for the chance! PS- I do follow, but can't comment when logged in to Reader - please excuse the anon. comment! i'm also following you through Google Reader! I love the navy and blue stripe planner and this is my lucky year also! I'm like you, I love a new planner. Total necessity!! What a fun giveaway! I'd chose the gray "lucky year" planner, for sure. And I'm a follower! These planners are fantastic! I would choose either the lattice or stripe planner. They're so pretty! Oh my goodness, how have I never heard of these adorable planners before?! I love the navy & white striped. And what a wonderful cause she is donating a portion of her proceeds to!! I Love the Navy and white striped planner! P.S. Recently subscribed to your blog... and am obsessed! I grew up in Marin County and now live in LA so I so enjoy reading all your posts about SF/Marin. Thanks for sharing!! 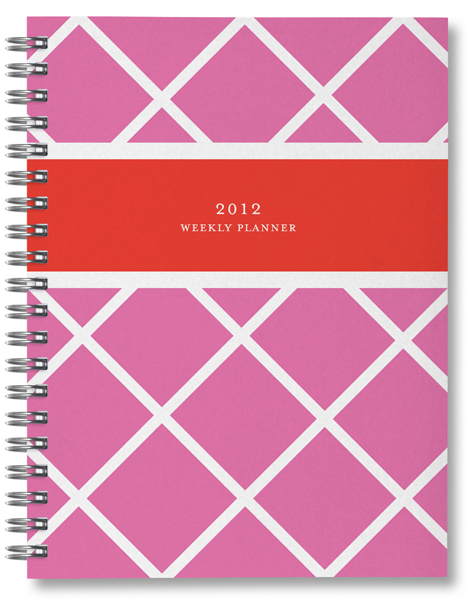 i love the pink lattice planner! the red stripe across the front gives it some edge. great giveaway and i LOVE deliciously organized! thanks! my e-mail (straight to my phone) is weigna@gmail.com. looking forward to winning! for sure the stripped planner! oh how I would love that beauty! I'm a follower and I love the striped planner! All of them are just perfect! I'd choose the yellow polka dot planner. Would be so much fun to look at such a cheery print everday! I posted a Facebook status about your giveaway! I'm a follower! And would choose the "my lucky year" planner! I love the polka dot! The yellow is just so much fun. Quite probably the navy and white striped one, althought the pink one is pretty darn cute aswell! my favourite one is 2012 stripe planner, so cute! I would choose the 2012 striped planner, but they are all soo cute! 2012 Lattice Planner! Too Cute! Just shared on twitter and +1'ed! Planners are my weakness! I love love LOVE getting a new planner...so much so that I've been known to buy a new one more than once a year! I simply adore the the 2012 navy and white stripe planner! It seems like it would be the perfect planner that I could use for work meetings and personal appointments. I'm keeping my fingers crossed that I'm a lucky winner of one of Sarah Pinto's weekly planners! I love the luck one.. and the yellow polka dot one... and all of them. So hard to decide. Mentioned your giveaway on my blog today! oh love this! my favorite is the navy & white striped! love the blue and white stripes! I LOVE the "this is my lucky year" planner! Hmm...I'm having a hard time deciding between the Horseshoe Planner and the Lattice Planner. But I've been really into grey lately...so I'd probably have to go with the Horseshoe planner! love the blue stripes planner!! I want this planner so bad! Cute! I love the blue and white stripes. I love the idea of a paper planner! Much more stylish than an iPhone! I am a subscriber. Thanks! I love the 2012 Stripe Planner! I am a follower of Deliciously Organized! I would definitely pick the Horseshoe Planner. Such a fun giveaway! Awesome giveaway! Love the lattice planner--great color combo! I love the navy & white planner with pink accent!! Sure could use a planner to keep up with my fun and crazy life!! Oh, I love "This is my lucky year" as well! I just started looking for a new planner today, so thank you for introducing me to Sarah Pinto! I love them; especially the 'this is my lucky year' planner. So cute! i'm a blog follower and my email is schaefka@gmail.com! I love the "this is my lucky year!!!" (maybe I will be the lucky one to win ;)) It's adorable AND functional! Perfect! oh my, the navy and white stripes-- definitely! I would love to win!! I love the blue and white striped one! I am a follower! I love the blue and white striped with the pink. If I HAD to chose, it would be the polka dot planner, but I love them all! Thanks for the giveaway! I'd pick the striped planner, hands down! Very fun! 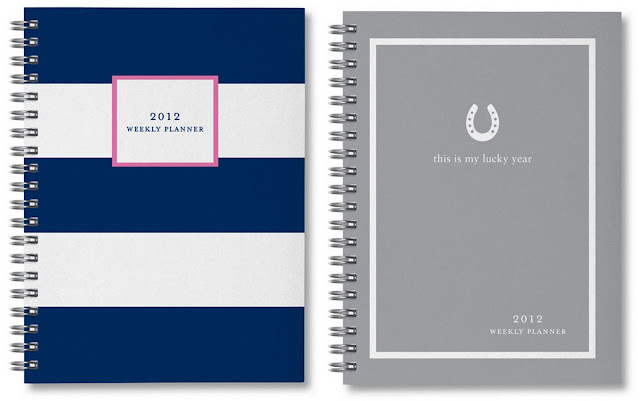 I went to the site and I would choose the 2012 Horseshoe Planner! Super cute! I heart the pink one for sure. I have been searching for a metal ringed weekly calendar for my crazy scedule.